Back to the good old Indian embroidery once again!!! This time the topic of interest is Kantha. What I find intriguing about Kantha work is the use of one simple stitch to create intricate motifs. Wherever I looked, I found this point being mentioned. But is it all that is there in this technique? I looked around a little more and found some interesting stuff. Here's what I've understood after reading through some materials. The art of Kantha (pronounced Kaatha in the north,Kontha in the east,kantha in the south) originated among the rural folks of India and literally means 'rags'. It was a method used to make fresh usable pieces of clothing from old worn out clothes especially saris. Bengalis were especially reluctant to throw away their fine quality muslin and cotton saris.All the old clothes are first cleared off the zips,hooks and buttons and any other embellishments and then piled in layers and stitched.These could be made into differents objects such as notebook wraps,toilet accessory holder,warm quilts,wallets,pillow covers,blankets,absorbent wipes etc. 4) Lep kantha --are rectangular wraps heavily padded to make warm quilts. The whole piece is stitched in a wavy pattern. Simple embroidery is done on the finished quilt. 6) Sujani kantha -- decorative quilted kantha used as blankets or spreads during religious rituals or other occasions. Originated in Bihar. So if you hear these terms, remember- they are Kantha products and not stitches or techniques in Kantha embroidery. Then what about the stitches,motifs and techniques ? As everywhere mentioned, the fundamental stitch for Kantha work is the Running stitch .But there are various standard styles for stitching them. The technique is classified broadly into JOD and BEJOD .Jod means together or aligned and Bejod means not together or nonaligned. You can see the pic below where I've pointed to the different styles. Here, I tried the Jod and the Bejod alternately on a Kantha motif just to show you how each style looks different. One can also stitch randomly without any specific style. See the base of the plant. This one is again a standard pattern called Dhaner Shish(rice stalk) or Khajur Chari (Date branch).This is a bejod technique. Doesn't it remind you of Darning stitches? The bottom motif is called Tara butti or Jhinge Phool. The word butti usually stands for a small motif that can be placed throughout a fabric. So, here the Tara (star) is a butti. It can be placed in a sequence or as individual motifs. Jhinge phool means flower of the ridge gourd. 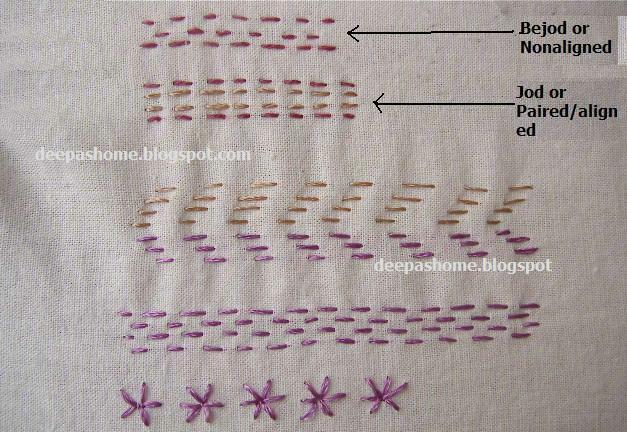 Here are some very simple motifs used in Kantha.Usually the stitch under the fabric should be shorter than the one above.Earlier I had stitched a tree motif on a handkerchief. If you look around the web, you will find a lot of Kantha embroidery pictures.Here are some free patterns. Have you ever wondered why some of these patterns look so asymmetrical or imperfect? Well, that's because the people who stitched them did not trace them from available patterns,they free handed them. Those creations have now become synonymous with Kantha and we try to emulate by copying them. 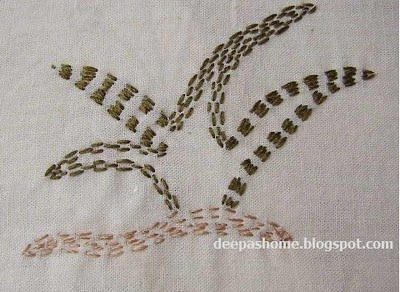 Infact, any pattern can be stitched using Kantha technique.A little imagination is all what is needed. I'll be back with some more Kantha techniques next time.Do let me know your thoughts about this technique .Iam sure there may be many among you who're well versed in Kantha work. I would love to hear from you. Is there any book on this method? I've not been able to find any until now.May be some of you can help. Thank you for this wonderful post!!! I love it. Deepa, and excellent informative post... who knew the running stitch could become so "regal".... I have never tried Kantha work, in fact, I don't use the running stitch very often, I always felt it to be "primitive looking" and use it sparingly, but your post has made me see it from a different perspective. (no package yet?? I wait anxiously but Judy tells me it took forever for hers to get to you... I will be patient!) Hugs. 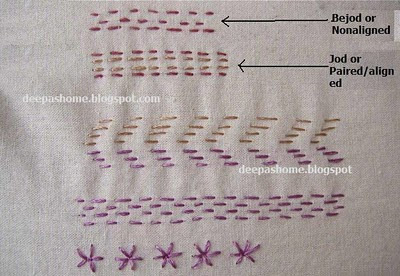 Another stitch I have noticed in kantha work is a knot stitch. It doesn't look like french knots also. They are used to fill the center portion of small flowers. I'll try to find more info about it. You just answered some questions i had about certain stitches, or rather the appearance of them--thank you! I've just started embroidering on a quilt made from my mother's saris and found your posts most interesting. Thanks! Wow That is absolutely awesome..... It's such a pretty Kantha work pattern! Thank you so much for sharing your knowledge with complete novices like me ! Thank You Deepa for all your knowledge with the Kentha Embroidery. I have just recently discovered the Kentha quilting and I am fascinated with the art and history of the spreads and quilts. Many thanks Deepa, I discovered Kantha just a few minutes ago and your piece was very informative! Thank you so much for this wonderful explanation ! Thank you for this information and the research that went into it. I've recently started experimenting with the running stitch after seeing photos of other people using it. I have recently taken up hand sewing again - a form called Gentlework. I find hand sewing very calming -thanks for sharing this …. This is one of the most informative posts I've seen on Kantha quilting! Great tutorial! Could you tell me what kind of threads are used in kantha embroidery? Hello! I have seen kantha in several places recently and tried it myself yesterday. Now I want my own quilt! :-) Thanks for some information about this beautiful art. Blessings to you!